Drake Scoops + Tees is the latest Drake branded shop to open up, but only for the summer. I'm quite sure nearby residents breathed a collective sigh of relief when the paper came down off the windows last week to reveal not another trendy bar or restaurant, but a cute little ice cream parlour and t-shirt shop. Lucky for me, since I can't manage to eat a cone without dripping something down my front, at least here I can get a replacement, stat. 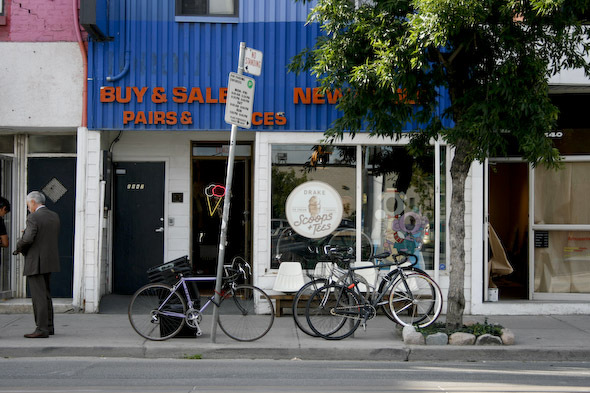 The shop design is minimal but evokes a bit of childhood nostalgia, with pictures of toothy kids on the walls and a bike in the front window. 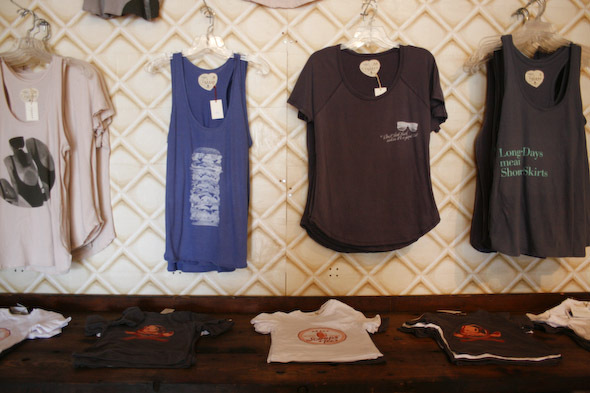 In the back of the shop hangs Shared tshirts made of high grade Supima cotton, and the designs are exclusive to Scoops. The marketing concept seems a bit odd at first, tshirts and ice cream, but the aim is to capture the two best parts of summer. I can easily see coming in for one of the two and walking out with the other (or both), maybe that is the idea. Sneaky. The ice cream is from a local brand, Metropolitan - which is made by hand using only natural and raw ingredients (it's also Kosher). The electric green Mint Chocolate Chunk caught my eye, but I was disappointed to discover only small chocolate chips instead of big, hearty chunks. Greg's ice cream or Ed's Real Scoop this ain't. The ice cream had a distinct natural taste and was creamy, almost a gelato texture, but it was light on flavour. Fortunately or unfortunately, depending on how you look at it, it was not overly sweet so it would be easy to plow through a pint without making yourself too sick - but isn't that the point of ice cream indulgence? 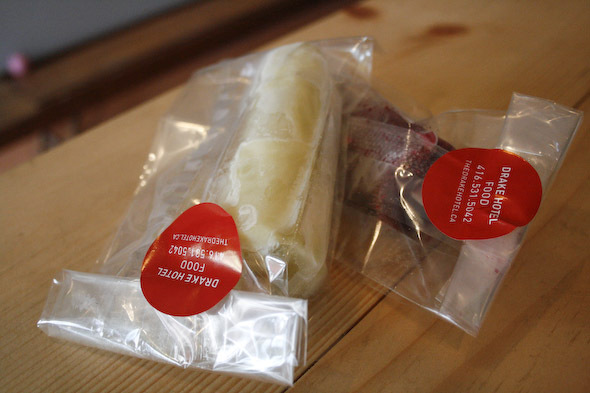 Drake Scoops + Tees has a small selection of curious flavours. 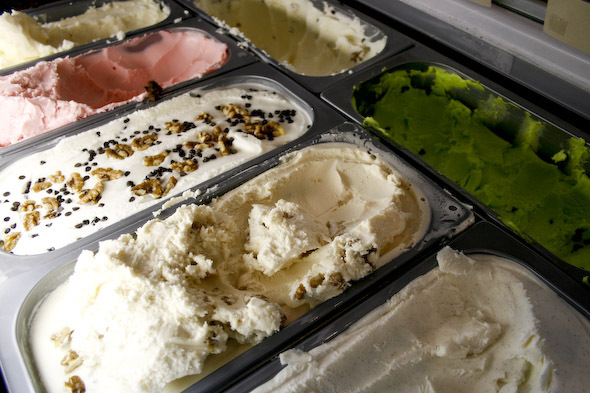 You're not going to find your typical ice cream parlor flavours here like bubble gum or rocky road. Instead expect fig and port, blood orange sorbet, strawberries and cream, and green tea. 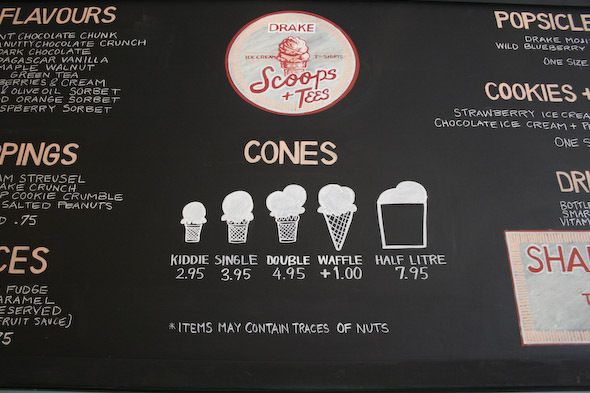 Scoops range from $2.95-4.95, with an additional $75c for Drake made toppings like graham streusel or corn flake crunch. Sauce is also $75c extra but well worth it for the bourbon caramel which I understand is unhealthy to drink by the gallon but yet I want to anyway. In the cooler by the window you can find popsicles in "Drake Mojito" and "Wild Blueberry Yogurt", however what I will be coming back for are the ice cream cookie sandwiches, with Drake cookies made by David Chow, filled with ice cream. Drake Scoops + Tees is open Monday to Wednesday 12-9, Thursday 12-11 and Friday and Saturday 12-midnight.